A financial hub capable of competing with the likes of New York and London. A country that decades ago was a poor country whose rulers dreamt of trying to make it like Sri Lanka. At least Dubai had some oil in the beginning which was used to kick-start the economy but Singapore had no natural resources at all. How did this tiny city state become so successful? Being under the rule of the British for over 100 years, Singapore was merged with Malaysia under the Federation of Malaysia. After two years, in 1965 the Malaysia Parliament voted to expel Singapore from the Federation of Malaysia. A tiny country, just expelled from a federation and sandwiched between two large and powerful countries, Indonesia and Malaysia. Singapore was on its own with no natural resources and a largely uneducated populace. In 1965, much of the Singaporean population was unemployed and two-thirds of Singaporeans were living in slums. Singapore lacked water supply, sanitation and infrastructure. It tried to ask help from the rest of the world to develop but no help came. Singapore was in a state envied by none. Lee Kuan Yew set about industrialising Singapore. But the problem was Singapore was a trading nation. But trading too was shaky as its two neighbours were not very friendly to it at that time. One of the few but greatest asset Singapore had was its geographic location. A huge fraction of the world’s shipping passed through the Strait of Malacca. Singapore started spending on the manufacturing and shipping sectors. Singapore needed a lot of investment and it had to come from the West as its neighbours were not approachable at that time. For the Americans and the Europeans to invest in a faraway Singapore, Singapore had to portray itself as a very attractive place to invest. With its geographic location, Singapore was not only a good place to trade but also to manufacture as Western and Japanese companies can manufacture in Singapore and export it elsewhere. Singapore created an environment where it was attractive to investors. Taxes were reduced and trade unions were strictly controlled. Lower taxation later attracted even Swiss banks to set up in Singapore after the Swiss Government increased taxes. With low taxation and no trade unions and strikes to worry about, many foreign countries started moving their companies into Singapore. Within a decade, 25% of Singapore’s manufacturing was foreign owned or a joint venture with a foreign investor. Lee Kuan Yew went further to keep Singapore safe and business-friendly. The death penalty was brought in to punish anyone dealing with narcotic trade and involved in large scale corruption. In addition to making starting a business in Singapore easier, these made Singapore very attractive. Most of these came at a price. Singaporeans lost a lot of their freedom. Trade unions were suppressed and media freedom was limited. Anyone causing harm to national interests were arrested without proper legal procedure. But with Singapore rapidly growing at double digits, the economic growth seemed to make the majority of the people happy. The success story of Singapore cannot be told without mentioning its founder Lee Kuan Yew. He had a vision to transform this city state into a success story. With no natural resources, it was a tough task. But for any country to develop, its citizens have to be made satisfied. So Lee Kuan Yew created the Housing Development Board and the Economic Development Board. Singapore was a poor nation which had got its independence from Malaysia in 1965. So many Singaporeans were living in ghettos. The Housing Development Board set about building high rise apartments for the people and moving them in. As Singapore is small and with a high population density, apartments were the solution to the housing problem. The housing development board transformed Singapore into a world class metropolis and gave the citizens of Singapore a superior standard of living. The Economic Development Board helped Singapore build up local businesses and industries which resulted in a lot of job creation. This has seen a phenomenal rise in income for Singaporeans. In 1965, Singapore’s per capita was $ 500 but today it is over $60,000. That is a 120-fold increase. This meant the people of Singapore were happy with the progress of their country and it gave a stable government which resulted in further growth. 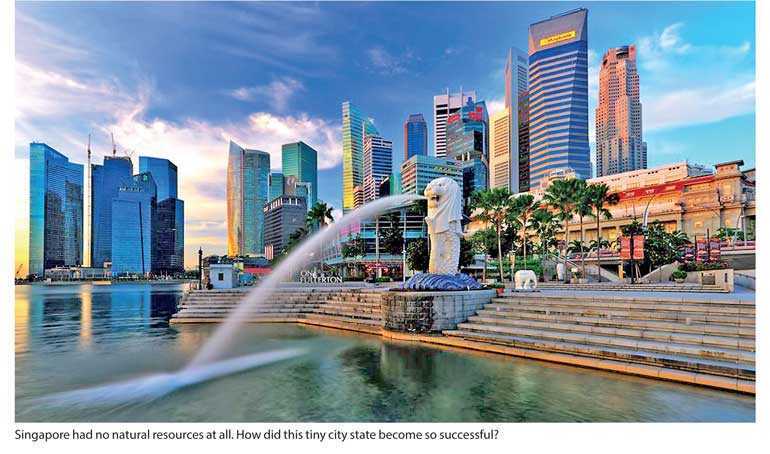 As FDI poured into Singapore, its Government focused on its human resources. Many technical schools were set up. Multinationals were encouraged to educate the local workforce. In the late 1960s, Singapore was manufacturing textiles and other basic items. But the Government trained its workforce in electronics and petrochemicals. This had a very good long term effect. Two decades later, Singapore would be into industries ranging from logistics and information technology to biotech research, pharmaceuticals and aerospace engineering. A remarkable achievement by investing in the people of Singapore. Even the world’s leading biotech companies have set up in Singapore. Today the Port in Singapore is the busiest in the world and when it comes to the cargo tonnage handling, it is second only to the port in Shanghai. Singapore invested heavily in infrastructure. It built its airport to a world class level at the beginning itself. This was crucial as anyone visiting Singapore came through the airport and the first impression was the best. To explain Singapore’s size, Sri Lanka is 90 times larger than Singapore. Singapore has no natural tourist attractions yet it draws in 10 million tourists a year. It even has a night safari and a nature reserve. Singapore has two of the most expensive integrated casino resorts in the world. In addition to medical tourism which is thanks to its heavy investment on world class hospitals and medical professionals. There is a lot to learn from Singapore, from its very strict laws to its zero tolerance for corruption. Singapore’s massive investment on human resources which moved the country from manufacturing basic goods to advanced biotech products which give a much bigger profit and revenue to the country. Investing in the youth of the country is the best way forward. Singapore’s investment on infrastructure is also to be noted. Its world class airport gives an impressive impression first to anyone travelling into Singapore. Lastly, Singapore ranks second in the world in Ease of Doing Business. This I feel is the most important as foreign investors do not like wasting time on government red tape. Sri Lanka used to be a model for Singapore decades ago. Sri Lanka is 90 times bigger than Singapore and has four times the population. Sri Lanka has many natural resources including tea and rubber which Singapore doesn’t have. Singapore’s geographic location was its most important asset but Sri Lanka’s location is not all that bad either. If Singapore with no natural resources can become an economic superpower, there is no excuse for other developing countries.